The warm-up is an essential introductory part of the training session that helps participants prepare both mentally and physically for the training session. Warm-up techniques can be broadly classified into two major categories: passive warm-ups and active warm-ups. For the most favourable conditions, each GF workout, regardless of its type, should maintain the recommended structure. This allows instructors to include all health-related fitness components in a single workout. The music used in fitness classes can be a determinant for the motivation levels in those classes, and therefore should be adjusted to the client’s profile. 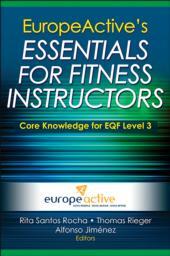 Endorsed by EuropeActive, this text includes fundamentals and best practices of concepts, duties and responsibilities that fitness instructors perform on the job. The content applies to level 3 of the European Qualifications Framework. Build rapport and motivate participants. Identify participants’ motives and goals. Prepare appropriate choreography and use music. Provide effective and safe instruction; display and provide feedback on technique; and give advice on intensity, progressions and adaptations. Deliver excellent customer service and be a positive role model for participants in a clean and safe environment. For individuals working toward level 3 of the European Qualifications Framework (EQF) and fitness professionals striving to comply with the latest industry standards and best practices. Alfonso Jiménez is a professor of exercise and health and the faculty dean of the health, exercise and sport sciences department at European University of Madrid (Spain) and a member of the scientific advisory board of UKActive Research Institute. Dr. Jiménez holds a visiting professorial appointment at Victoria University in Melbourne, Australia, as the international research associate. He is the chair of the Fitness Australia/ISEAL research programme and scienntific advisory committee at the University of Greenwich in London. During the time that he was head of school and deputy dean at Victoria University, Dr. Jimenez served as a professor and head of the Centre for Sports Sciences and Human Performance at the University of Greenwich. From 2009 to 2012, Professor Jiménez was the chairman of the standards council of EuropeActive, which at the time was called the European Health & Fitness Association. He was awarded honorary membership in recognition of his outstanding service. Dr. Jiménez’s background before entering academia centred on the fitness industry in management, research and sales.